Image caption Belfast City Council said the plan is valued at around £250,000. 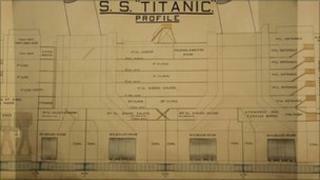 A hand-drawn plan of the Titanic, unseen since 1912, will go on display at Belfast City Hall on Easter weekend. The plan, measuring 33ft by 5ft, was drawn by White Star Line architects to assist an inquiry into the causes of the ship's sinking in 1912. Valued at about £250,000, the plan is part of Belfast City Council's Titanic 100 exhibition, marking the centenary of the ship's launch. The plan will be on show from Good Friday until Easter Tuesday. The plan was commissioned to assist the British inquiry into the sinking of the Titanic, headed by Lord Mersey in May 1912. It takes the form of a detailed cross-section, and is heavily annotated, partly to assist the commission in understanding the complexities of Titanic's construction. Still highly visible on the plan are the marks where inquiry officials believed the iceberg made contact with the hull of the ship. The 1912 British inquiry into the sinking of Titanic lasted 36 days. It heard the testimony of nearly 100 witnesses, including surviving crew members, White Star Line officials, and maritime experts. The only surviving passengers interviewed were Sir Cosmo and Lady Duff-Gordon, and White Star Line President J Bruce Ismay: all first-class passengers. The inquiry was heavily criticised for not speaking to a single passenger from the lower decks of the ship. After asking more than 25,000 questions of witnesses, the inquiry eventually concluded that: "The loss of the said ship was due to collision with an iceberg, brought about by the excessive speed at which the vessel was being navigated." The plan will be the centrepiece of an exhibition by specialist White Star Line auctioneers Henry Aldridge and Son at Belfast City Hall from Saturday 23 - Tuesday 26 April. Part of Belfast City Council's Titanic 100 festival, it will feature over 250 items of Titanic and White Star Line memorabilia.